We’ve turned everyone’s favourite summer dessert into an ice cream. Fresh or frozen berries both work well. 1. Pour the cream and milk into a pan with a pinch of salt and heat to just before boiling point – bubbles will start to form at the edges. Meanwhile, whisk the egg yolks, sugar and vanilla in a large bowl until thick. Slowly pour the cream and milk over the egg yolks, whisking continuously, until combined. 2. Rinse out the pan and return the custard to the pan, set over a low-medium heat. Stir constantly with a wooden spoon or spatula, making sure to cover the entire base of the pan. After 5-8 minutes the custard will thicken, start to feel velvety and thickly coat the back of a spoon. Quickly sieve the custard into a clean bowl, cover the surface with cling film and leave to cool completely, then chill for 1-2 hours. 3. For the meringue, preheat the oven to 130˚C, gas mark 1. Line a baking tray with baking parchment. In a large clean bowl, use electric beaters to whisk the egg white with a pinch of salt and a squeeze of lemon juice, to stiff peaks. Gradually add the sugar, whisking continuously until stiff and glossy. Pile a 3cm-high meringue onto the baking parchment and bake for 1 hour 15 minutes. Remove from the oven; set aside to cool. 4. For the ripple, put the berries, sugar and lemon zest and juice in a small pan with a pinch of salt. Bring to the boil, then simmer gently for 10 minutes. Press through a sieve, discard the seeds and leave to cool completely. 5. Churn the chilled custard base in an ice-cream maker according to manufacturer’s instructions. When the mixture is thick and creamy and the blade almost stops, break ¾ of the meringue into chunks and churn very briefly through the ice cream. 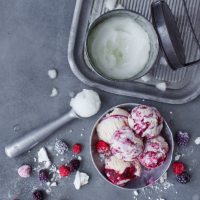 Transfer ½ the ice cream to a tub and ripple through ½ the berry coulis. Ripple the remaining ice cream and coulis on top and dot with the final ¼ of the meringue. Cover and freeze for at least 4 hours, or preferably overnight. Remove from the freezer 5 minutes before serving, with fresh berries, if liked.